The Italian military had determined that they required an armored personnel carrier back in 1938 during continuing reforms and modernisation within their armed forces as the majority of mechanised transport was by unprotected trucks. Little was done (mainly for financial reasons as the bulk of military funds went to the Navy) in this regard until the outbreak of World War Two, which for Italy was the 10th of June 1940. Various options were open to the Italians as to how to go about fulfilling the role of a mobile protected troop transport and various ideas were proposed. A memo dated the 24th of May 1941 summarised those options as using the Dovunque 35 truck, a smaller carrier based on the T.L.3, halftracks (the favored choice of the Army), and even a fully tracked design as an analogue to the British Universal Carrier, which the Italians had captured examples of in the North African desert. Fighting in the desert reaffirmed the importance of a mobile protected transport with large distances needing to be covered by infantry, particularly the elite Bersaglieri units. Making these units more mobile was seen to provide a significant increase in military capability. The War in North Africa was not going well for Italy and the need for new improved vehicles was urgent. By the 3rd June 1941, a large type of troop transport was being considered, which led to the Dovunque 35 blindato. At the same time, it was also suggested to try and make such a vehicle using a standard medium truck fitted with a diesel engine. The vehicle chosen was the Fiat 626NLM (Nafta Lungo Militare), which had entered production in the second half of 1940. This was a long wheelbase (L= lungo / long) military specification (M-militaire / military) version with a diesel engine (N = naptha / diesel) and was produced in huge numbers. It was a good choice as a donor vehicle as it was both reliable and already in production as a standard truck for the Italian Army, having been set as the unified truck of choice in July 1937. So successful was it that versions of the 626 stayed in production well after the war. With the need for such a vehicle clear, the Centro Studi Motorizzazione (CSM) (the department which would examine new vehicles) immediately got to work and took a standard Fiat lorry and stripped from it all of the original bodywork. In its place, they modeled in wood a large rectangular shaped body with an open top. The exact details of the project are not known, as the original paperwork is missing or destroyed, likely in the chaos following the September 1943 armistice, but some photographs and limited records do survive on which to examine the design. The vehicle itself is remarkably clean lined with a large, single panel of armor on each side angled inwards and, below it, a long vertical plate covering the underside of the vehicle and the top part of the rear tires. 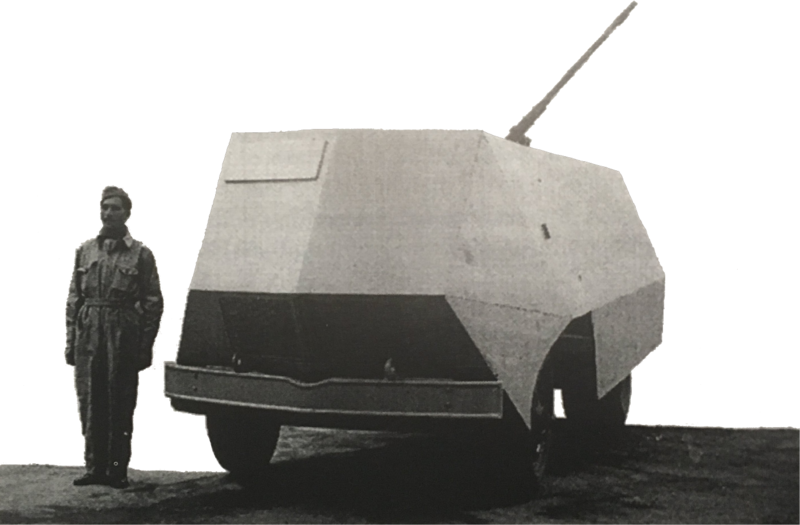 The front of the vehicle was made from four armored panels to create a classic pointed shape. A single large rectangular hatch was in the front right-hand side for the driver. Both of the lower two sections had large rectangular holes cut in them to facilitate the armored grilles for the radiator. No loopholes were provided for the mounted troops to use at all in any sides of the vehicle, unlike the Dovunque 35 design which had 3 on each side and two in the rear. A large bumper covered the full width of the vehicle at the front, harking back to its days as a normal truck. The driver actually sat quite a long way forwards because he was moved to sit alongside the engine which divided his seat from a further front passenger seat. Next to each of the front seats on each side was a single opening large rectangular door. Mounted troops would be sat along two bench seats which ran the full length of the vehicle from the cabin to the rear. Given the length of the vehicle, it would easily seat 8-12 soldiers or a sizeable quantity of stores. 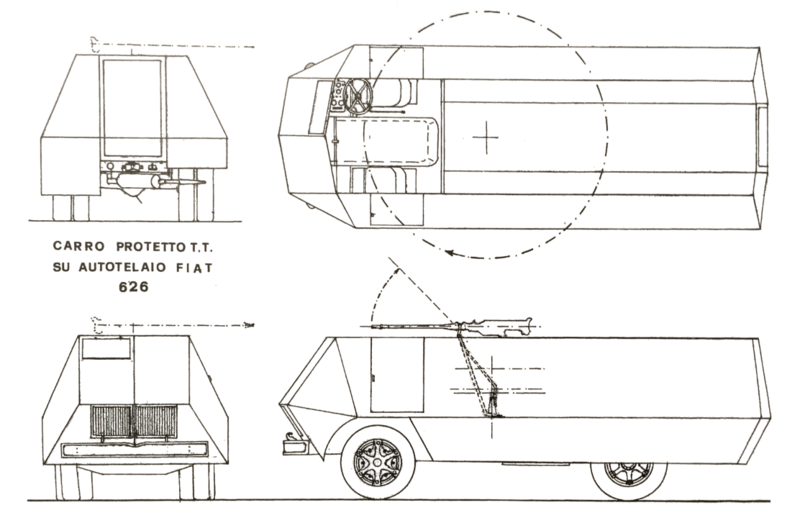 It should be noted that the unarmored truck version, the standard Fiat 626N had a seating capacity for 18 soldiers, but when the vehicle was armed by mounting a 20mm anti-tank rifle, it would likely reduce the capacity. At the rear of the vehicle, there was a single large one-piece rectangular door fitted into the angled rear armor for the soldiers to mount or dismount through. Power for the vehicle, assuming no additional modifications to the existing engine used in the 626NLM were made, was supplied by the 5.75 litre Fiat model 326 6 cylinder inline diesel engine producing 70hp at 2200rpm (it was only 67hp on the 626N) and had a standard fuel capacity of 75 + 5.5 litres (80.5 litres). As with the A.S.37, which had additional fuel tanks added, it would be expected that this armored personnel carrier version could adopt the extended range fuel tanks as used on the 626N (colonial service) which was in production until 1940. This additional 135 litre tank, (mounted on the 626N Colonial under the rear of the chassis) would have provided a significant extension to the operating range for a total fuel capacity of 215.5 litres. With a maximum laden weight of 6.5 tonnes and a payload capacity of 3 tonnes, the truck was ideal for a variety of roles. Stripping off the body and using just the frame allowed for a new armored body to be constructed instead. 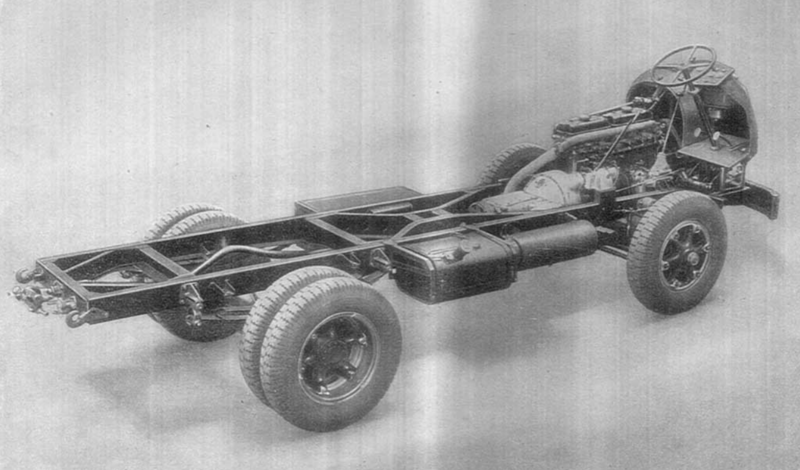 The 626NLM extended the standard truck wheelbase from 3 metres to 3.32 metres, allowing for a significantly longer load bed for the truck. 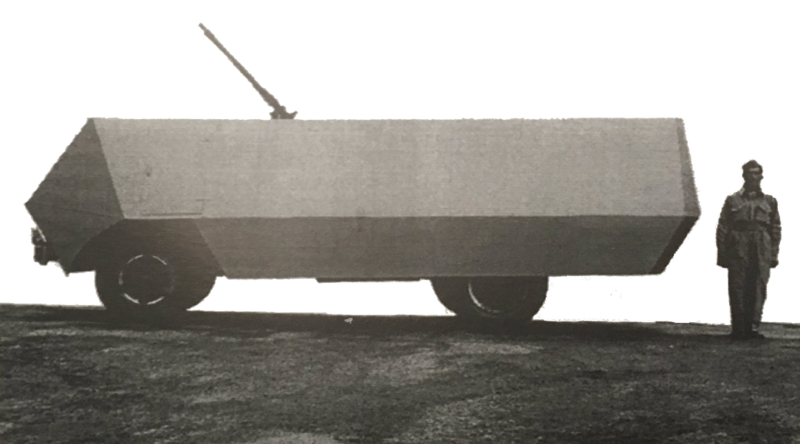 The exact thickness of the armor is not known, but every other project for the same basic role as this vehicle, such as the Autoprotetto S.37, used flat steel plate between 8mm and 10mm bolted to a steel frame. This armor provided sufficient protection for the driver and troops carried in the back from small arms fire and shell splinters, but nothing else. In the design, unusually, a machine gun is omitted, replaced this time with the powerful Solothurn 20mm anti-tank rifle, already used mounted in the CV.3 series light tanks. This rifle would provide much needed additional firepower for tackling lightly armored enemy vehicles such as armored cars, Universal Carriers and even some tanks. The rifle was fitted to a tall mount, fixed to the floor centrally aligned down the length of the vehicle and just ahead of the centre line from the side. This mounting point permitted the weapon movement around a full 360 degrees of the vehicle and could elevate up to around 45 degrees, although it is not clear how useful it may have been against aircraft. The project did not go anywhere. The Dovunque 35 based armored personnel carrier was selected instead and was put into a formal evaluation as a prototype. It was a better overall design than the Fiat attempt with firing ports for the troops etc. meaning they would be better protected but the exact reason why the Fiat was not chosen isn’t so clear. Either way, the Fiat 626 based APC idea never saw service and the mockup was presumably reused as a truck. The new artist does a good job, but the color in the picture looks to me yellow..ish. Not a big deal, the vehicle was raw metal before the paint job. Thanks for the appreciations Jes! You are right that the pictures have a yellowish tinge, however that is due to the photo quality (and aging), and not due to the actual color of the vehicle. Nice article, just a couple minor corrections: NLM is Nafta (not “Naptha”), Lungo, Militare (without the third “i”).